Several Heps athletes used ECACs and IC4As as a last-chance qualification for the upcoming NCAA East Region Preliminary Round in Jacksonville, Fla., on May 26th to 28th, where the top 48 declared athletes and top 24 declared relay teams will be able to participate. Many Heps athletes finished in the top eight at ECACs and IC4As, earning “All-East” honors. 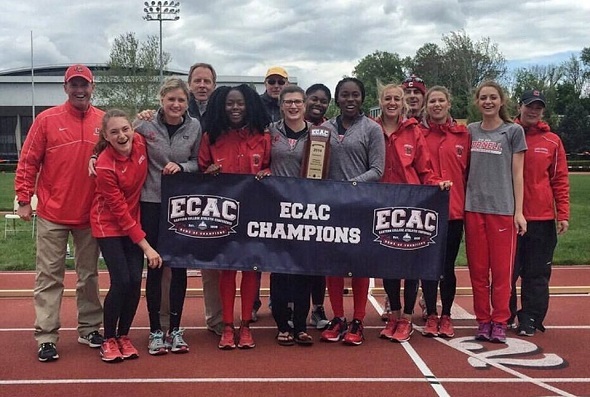 It was sweet redemption for the Cornell women this weekend as they won the ECAC Championships at Princeton after coming in only third at Heps a week ago, becoming the first Ivy League team to win the ECAC title. Cornell beat James Madison by a score of 57.5 to 54 points. Penn and Princeton tied for sixth with 33 points, Harvard was ninth with 29 points, and Brown was 11th with 25 points. On Friday, Cornell sophomore Taylor Baker placed fourth in the discus with a heave of 146’11”. In the 3,000m steeplechase, three Ivy athletes placed in the top eight: Princeton senior Emily de La Bruyere was second in 10:12.31, Princeton junior Elizabeth Bird was third in 10:15.03, and Cornell freshman Briar Brumley was seventh in 10:29.44. De La Bruyere, who was second in the steeple at Heps last week, already has solid NCAA regional qualifying times for both the steeple and the 5,000m. Bird, who got a late start to the outdoor season (and was third at Heps in the steeple), improved her seasonal best by 11 seconds and looks to be on the rise heading into nationals. So does Brumley, who has brought her steeple time down by a full minute since the start of the season! Cornell freshman Eve Glasergreen won the 5,000m, also held on Friday night, in a time of 16:51.01, just three seconds off her personal best. All but one of the rest of the All-East honorees in the event were members of Heps Nation: Penn senior Elyssa Gensib (second, 16:58.02), Yale freshman Andrea Masterson (third, 17:01.05), Cornell sophomore Jessica Elliott (fourth, 17:11.56), Penn junior Clarissa Whiting (fifth, 17:15.22), Cornell freshman Gracie Todd (sixth, 17:21.80), and Penn sophomore Abby Hong (eighth, 17:23.88). In the 10,000, Harvard senior Emma Payne placed sixth in 36:09.27, a personal best—especially impressive considering she just ran the Heps 10,000m less than a week before that. Brown sophomore Quinn Bornstein was fourth in the 3,000m in a time of 10:03.31. On Sunday, Harvard sophomore Gabby Thomas demonstrated that she isn’t just queen of the Heps, but queen of the East. Thomas looked great heading into NCAA regionals, winning the 200m in 23.27. She was followed by All-East performers Taylor McCorkle (Penn, second in 23.78, a PR and 7th fastest in Ivy League history), Autumne Franklin (Harvard, third in 23.80, a PR and 8th fastest in Ivy League history), Adrian Jones (Cornell, fourth in 23.98), Jade Miller (Harvard, fifth in 24.06, a PR), and Imani Solan (Penn, seventh in 24.23). Penn’s McCorkle also earned All-East honors in the 100m, finishing second in 11.88. Brown junior Emmaline Suchland was fourth in 12.05 and Cornell’s Jones was fifth in 12.17. Jones was also a member of the Cornell 4x100m relay team that placed third in 46.16 (Udeme Akpaete, Taysia Radoslav and Ellen Shepard were the other relay members). Brown’s 4x100m relay team of Alyssa Leto, Audrea Holt, Mikela Waldman and Suchland placed fourth in 46.67. Speaking of relays, Princeton’s 4×800 squad of Summer Hanson, Allison Harris, Melinda Renuart and Anna Jurew was second in a time of 9:00.39. Four Ivy Leaguers earned All-East honors in the 800m. Princeton junior Zoe Sims was third (2:09.33, a PR), Cornell sophomore Shannon Hugard was fourth (2:09.41), Penn junior Carey Celata was seventh (2:12.42), and Dartmouth sophomore Bridget Flynn was eighth (2:13.94). In the 1,500m, Yale junior Meredith Rizzo was fourth (4:26.45) and Cornell sophomore Jackie Katzman was seventh (4:27.16). Cornell sophomore Taylor Baker was fourth in the discus with a throw of 146-11. Princeton sophomore Kennedy O’Dell, last weekend’s Heps champion in the hammer, was fourth in that event with a personal best throw of 186-05, and Brown sophomore Michele Bazile (second last weekend) was sixth with her own personal best throw of 179-06. Cornell sophomore Kate Gulbrandsen was fourth in the high jump with a leap of 5-07. Like the Big Red women, the Cornell men had a successful showing in Princeton as they finished second in the IC4A competition with 57 points. The men were led by two event winners and eight additional All-East performances. Rob Robbins added the IC4A javelin title to his Outdoor Heps title, as he won the event with a throw that went 236-09. Alex Rodriguez got some redemption at Weaver Stadium as he won the long jump with a new personal best distance of 24-10 that ranks him 25th in the East Region. Max Hairston was edged out for the high hurdle title by 0.002 seconds by Hampton’s Trey Holloway as both were clocked at 13.92. Sam Baxter also earned a runner-up spot in the 1,500m with a time of 3:49.61, finishing out his collegiate career on a high note. The Princeton men were in the team title hunt for most of the first two days of competition as they were boosted early on with an event win and two runner-up finishes. Eddie Owens came within 0.05 seconds of his personal best in the steeplechase as he won in 8:46.47. This is a new seasonal best by almost 9 seconds, which jumps him from around 40th to 8th in the East Region. Two Adams finished as runners-up in their respective event: Bragg finished second in the pole vault (17-01) while Kelly was second in the hammer throw (216-02). The Tiger men finished fifth with a score of 38.33 points. Sam Mattis and Noah Kennedy-White were the only Ivy duo to finish 1-2 in an IC4A event this past week, giving Penn 18 points in the team standings. They did so in the discus event where Mattis was the only athlete to go farther than 200 feet (201-02) while Kennedy-White had close to a 20-foot cushion over third place with his best mark of 182-11. They helped the Quakers finish 12th overall with 25 points. The final Ivy IC4A winner from the weekend was earned by a freshman – Brian Zabilski of Columbia set a new personal best by 3 seconds to win the 5,000m with a time of 14:11.60. Columbia was the fourth best Ivy in the overall competition, finishing 14th overall with 21 points. The remaining Ivy team finishes include Harvard in 16th (20 points), Brown in 17th (19 points), Dartmouth in 26th (11 points), and Yale in 29th place (10 points). This entry was posted on Monday, May 16th, 2016 at 8:17 am. It is filed under Athletes, Spotlight. You can follow any responses to this entry through the RSS 2.0 feed.